Here’s the scenario. Your boss just got confused looking at a Gantt Chart (perhaps my Excel version) and said they want something simple. Like a timeline of events happening during the course of the project. Not everything, just key milestones and dates and stuff like that. Well, you quickly go hoping to Visio…and…oh, what’s that? You don’t have Visio? You guessed it! 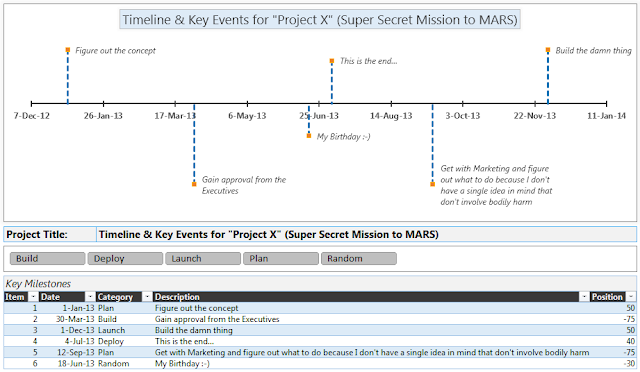 Here is an Excel project timeline template so you can satisfy these scenarios, and any other scenario you run in to where you need to generate a project timeline. If interested, stick around and read my article on this template. If you are just looking for the download so you can get to charting your Excel timeline…see below.